Patrick Malloy, Democrat running for the 50th Congressional District seat gets out the word on the street. 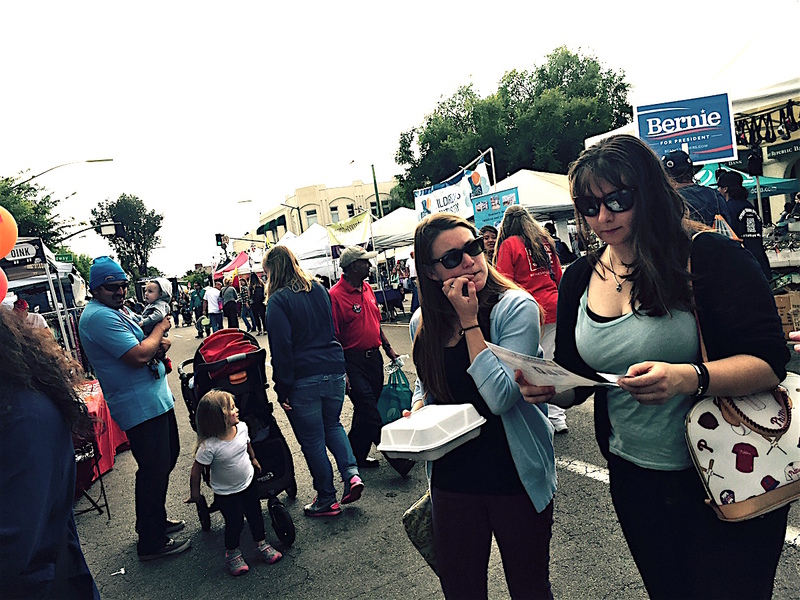 Escondido Street Fair(e) goers who didn’t get their fill of arts, crafts and music Sunday, May 15 at the semi-annual fair definitely got their fill of politics, local and otherwise. Everybody was there from Peta and green energy to Bernie, Sam and strange causes that seemed head-scratchers at best. People not only could register to vote, they also could find out about just about any political possibility and movement they could possibly imagine, and then some. Major activity took place between Broadway and S Kalmia Street. That’s where Patrick Malloy, Democratic challenger for the 50th Congressional district held sway, along with local progressives, Alianza Escondido and, if one were so inclined, face painting at the Alianza booth thrown in for good measure. 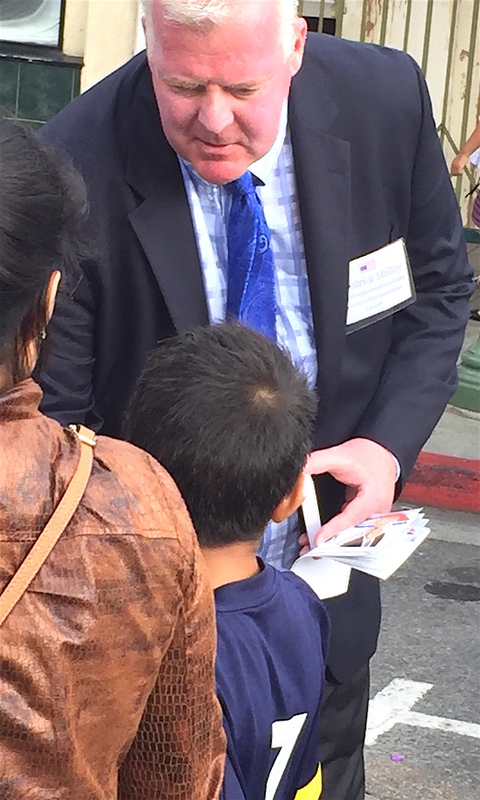 Patrick Malloy, Democrat running for the 50th Congressional District, seat hits the street. Hunter didn’t make it to the festival. His official residence is around East County somewhere. 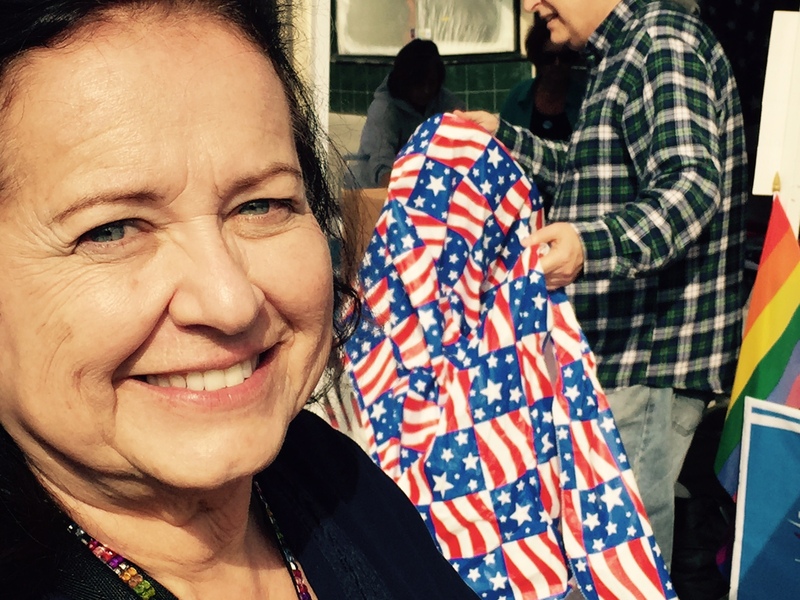 When Escondido got gerrymandered into the newly reformed 50th Congressional District earlier this decade it inherited the Hunter family fiefdom. Duncan Hunter Sr. who served from 1981 to 2009 passed down the heavily Republican-registered district to his son. June 7 is the primary between Malloy, Hunter and a small army of challengers, write-in and otherwise. Top two finishers square off again in the November general election. Nina Deerfield of Escondido Alliance/Alianza Escondido by the group’s booth at the street fair(e). Politics aside, the aftermath of the street fair has yielded some interesting community observations about the event that began in 1988 apparently in a much more eclectic form. Many commenters on Facebook bemoaned the perception that the fair has become more commercialized and geared towards commerce, veering away from the funky arts, crafts and just plain stuff people liked to do and see rather than buy. 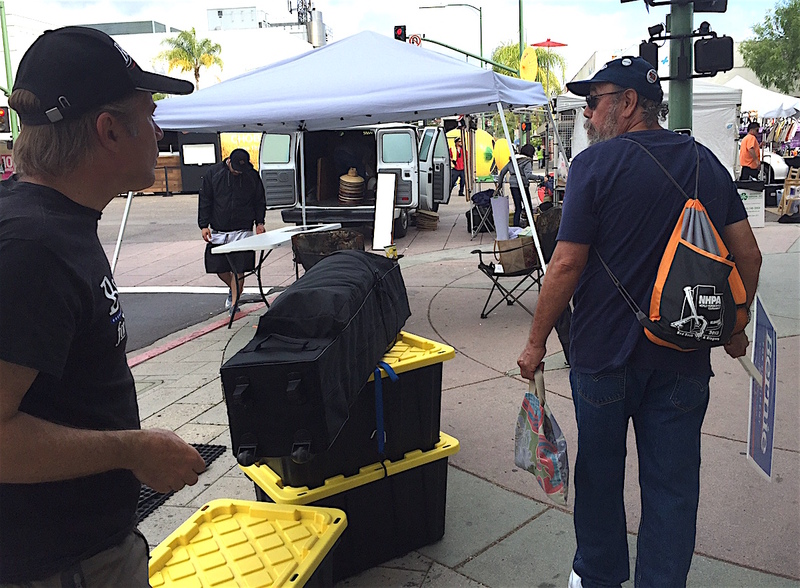 The next street fair is scheduled for October. That’s the month before you know what happens. Politics, and concerns, should resume on the street in even greater force then. Bernie people closing up their booth Sunday. Be the first to comment on "Got a beef? Hit the street."